Unemployment is one of the biggest challenges that the Middle East faces, and has faced for quite some time. In this very youthful part of the world, competition for jobs creates an overwhelming amount of pressure on job seekers and on companies alike. Job seekers now have to go several extra miles to stand out from the large applicant pool. Businesses and organizations are often bombarded by the volume of applications and are challenged to narrow down the prospects and make the most confident hiring decision. Even startups that are just beginning to dip their toes in the water can easily receive hundreds of applications, emails, and pleading letters for the handful of positions they offer at a time. But there is another big elephant in the room that we must confront, and it is known as the skills gap. No, this is not just a buzzword that is thrown around in research conferences and thought leaders’ Twitter feeds. This is a serious issue that affects everybody in the marketplace– employers and job seekers alike. Skills gap is the difference between the skills required on the job and the actual skills that the job seeker (or employee) possesses. As a matter of fact, 65% of business leaders and 59% of job seekers who participated in the Bayt.com 2017 Middle East Skills Report believe there is a skills gap in the market. For a starting place, think about the technological acceleration, and how it is impacting the type of skills that are in demand. The number of people who are online as well as the amount of data they are generating is growing exponentially. The development of virtual and augmented reality as well as the Internet of Things (IoT) is opening up many possibilities for new types of work (i.e. remote patient screening and smart contracting). Another example is the shared economy services. Think of Careem, Airbnb, and Udemy as examples. These new platforms empower the individual to be a self-employee, self-promoter, self-marketer, and, in a way, an overall entrepreneur. As a result, these market trends are reprioritizing valuable skills, and in some cases, demanding completely new competencies. Luckily, most of the skills that are in high demand remain to be soft and transferrable. 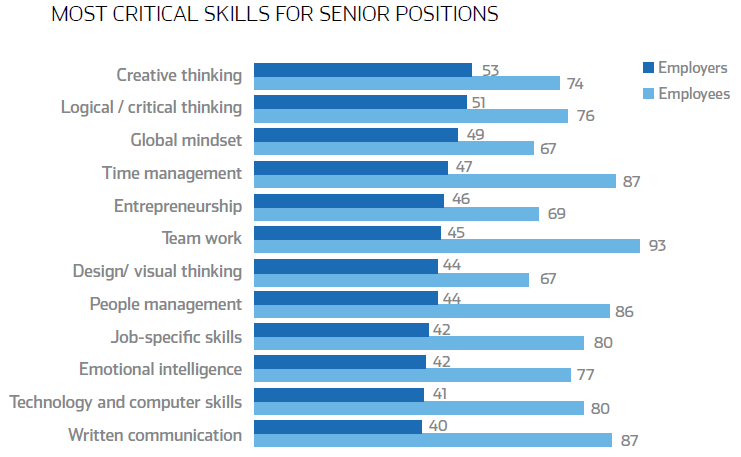 According to employers, the top three most important skills for mid-career or junior positions are teamwork (83% of employers said it is very important), time management (80% said it is very important) and written communication (76% said it is very important). Job seekers also agree; 84% of them said that teamwork is a very important skill, 83% said time management is very important, and 79% said written communication is very important. It is positive to note the fact that employers and junior job seekers agree on the most critical skills. From a job seeker’s perspective, knowing what employers expect from you and being right about it can only help one focus on developing those particular skills and land a job faster. When it comes to senior roles, the top three most important skills are time management (89% of job seekers and employers said it is very important), team work (88% of employers said it is very important and 89% of job seekers said it is very important) and people management (87% by both). There is a large agreement between employers and job seekers regarding the critical skills for this career level. 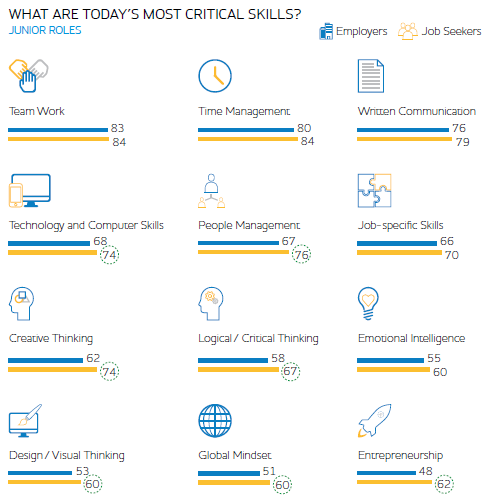 There are, of course, some small differences in their ratings of importance for each skill, but only one is big enough to indicate that it is not due to chance: visual thinking. 75% of employers rated it as very important while 69% of job seekers said it is very important. Creating powerful, highly visual presentations is a great way to influence and stand out as a senior resource in the company. Senior job candidates should realize how critical it is and allocate time to develop it. So, given that job seekers and employers agree on the most important skills in today’s marketplace, how difficult is it for job seekers to find jobs and for those hiring to find skilled talent? Finding good candidates for junior or mid-career positions is very difficult for about one in three companies (32%). It seems a little easier for junior candidates to find a job matching their skills, whereas a quarter of them claimed that it is very difficult to find jobs matching their skills level. There is a much bigger gap between what employers and job seekers think when it comes to senior roles. Just under a quarter (24%) of senior job seekers have reported that it is very difficult to find a job matching their skills. On the other side, the majority of businesses (58%) face major challenges in sourcing employees with relevant skills for senior positions. This may be surprising because it seems that the skills gap in the Middle East is not a matter of awareness, and despite the fact that companies can probably better communicate their required skills, there is already a common knowledge about them in the marketplace. What if the skills gap does not come from a lack of agreement on what the important skills are but from a mismatch in the assessment of one’s skills? What if job seekers and employees believe they are doing a great job on these critical skills, while hiring companies think the contrary? Job seekers and employers are very aligned on the skills that are most important in the market nowadays. Yet, both parties are challenged and most employers are having difficulties finding the type of skills they need in their prospective employees. So, what skills are the most difficult to find, and how do job seekers evaluate themselves on these skills? When looking to hire for mid-career/junior positions, 47% of employers surveyed said that they face the most challenges when searching for candidates skilled at creative thinking. 44% of employers said global mindset is very difficult to find, and 43% said visual thinking is very difficult to find. Job seekers seem to tell a similar story by rating themselves lowest on two of these skills. Only 50% of job seekers claimed to be “very good” at global mindset and 53% claimed to be “very good” at visual thinking. 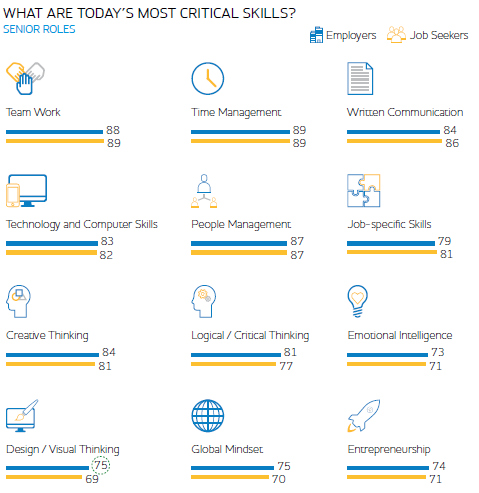 However, there is a discrepancy in their evaluation of their creative thinking skills against what employers said: 59% of job seekers evaluate themselves as “very good,” while 47% of employers say it is “very difficult” to find this skill. It seems clear that candidates overrate themselves on this skill and it may be that “creative thinking” means different things to businesses and candidates altogether. For senior roles, 53% of employers claimed that it is “very difficult” to find candidates who possess creative thinking. 51% of employers said the same about critical thinking, while 49% said that about global mindset. 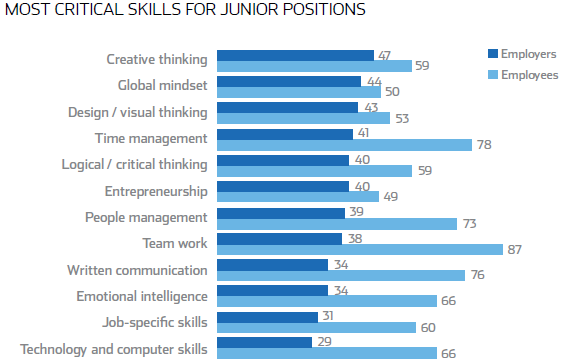 Similarly, to junior roles, job seekers rate themselves highly on the most critical skills. 93% of them said they are “very good” at team work, 87% said they are “very good” at time management, 87% said they are “very good” at written communication, and 86% said they are “very good” at people management. However, on time management and team work, the gap between candidates’ evaluation and businesses’ difficulty in finding the right skills is to the extreme: for time management, 87% of candidates rate themselves as very good, while 47% of companies said they have big difficulties in finding good candidates with this skill. Similarly, for team work, 93% of candidates rate themselves as very good, while 45% of recruiters find it very hard to find good employees with this skill. On job seekers’ self-evaluations, the Bayt.com study revealed that they rated themselves highest on the same skills they said are the most important. This is consistent but may also suggest that candidates feel compelled to say that they perform well on the skills they had identified as being critical. In conclusion, it is evident that the mismatch is between the skills companies have difficulty to hire for and the job seekers’ self-rating on these skills. This means that job seekers often overrate themselves, when in fact they need to take certain measures to upgrade and develop their skills. In light of the market trends and the mismatch discussed above, it becomes clear that the skills gap is a fully relevant topic today, and everybody should pay attention to it. Without doubt, working within these conditions requires the effort of everyone involved in the marketplace– governments, educational institutions, businesses, and individuals. But companies of all sizes can also champion this process by investing in the training and professional development of their current talent, as well as their prospective pipeline. It is also very wise for employers to maintain close contact with the technological changes at the macro level, but also when it comes to talent acquisition and skill matching tools such as Bayt.com. Over 40,000 employers rely on Bayt.com for the hiring technology as well as the latest market insights and data, and millions of talent matches have been made successfully. Bayt.com is home to more than 28.5 million CVs that employers can navigate and hire from. Companies who use Bayt.com rely on its powerful technology that simplifies and streamlines the screening and shortlisting process through precise filtering tools, ranking algorithms, screening questionnaires and assessments, and many other tools that make skill verification and matching talent significantly easier. This way, companies looking to hire can bypass the tedious stages, and focus on the most qualified candidates.